Culture Minister Ed Vaizey has placed a temporary export bar on the silver andirons to provide an opportunity to save them for the nation. A pair of 300-year-old Charles II silver andirons are at risk of being exported from the UK unless a buyer can be found to match the asking price of £541,000 (plus VAT of £108,200). Culture Minister Ed Vaizey has placed a temporary export bar on the silver to provide an opportunity to save them for the nation. Dated and hallmarked in London in 1680-1681, these firedogs - which are adorned with iconic historical figures in Egyptian and Roman history Cleopatra and Lucretia - demonstrate the importance of fireplace furniture during the period. 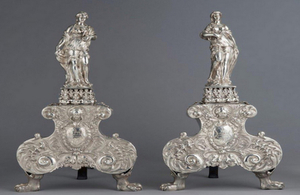 Silver andirons were a short-lived fashion as the introduction of coal in the early 18th century replaced wood as the fuel of choice in wealthy houses. An image of the silver andirons can be downloaded here.